With the Trigonometry class struggling, I attempt a pep talk. As usual, the students swiftly grasp my metaphor – and then hijack it. Me: You’ve seen hermit crabs, right? They move from shell to shell throughout their lives. And it’s scary for them to leave their warm, safe shells behind. It makes them feel anxious and vulnerable, because their pink little crab bellies are exposed. Me: But they keep on moving. And do you know why? Student #2: Because life is pain! Me: It’s because that old shell could only take you so far. It may have felt like home, but the new shell is going to feel even better. Me: Yes! And that’s the way it is with you guys. You have this old way of thinking about graphs – as shapes, or curves. And it worked great before, but now it’s holding you back. You’ve got to start thinking about graphs as relationships between inputs and outputs. And for a while, while you’re making that change, you’re going to feel scared and vulnerable, just like the hermit crabs. But trust me, it’s worth it. Student #3: Can we still go back to the old shell sometimes? Me: Sure. But you’re going to love the new shell once you get used to it. You might not even want to go back. Student #2: But it’s so safe here! Student #3: I don’t want to leave, Mr. Orlin. Me: Be brave, hermit crabs. Be brave! All students: We’re just crabs! We’ll be helpless! Don’t make us do it! Yeah. 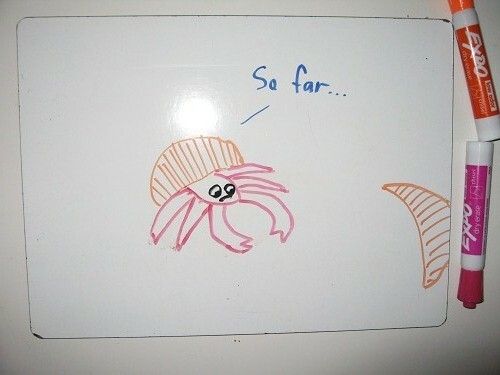 In my estimate of the ladder of pain, high schoolers are kinda in the middle, but hermit crabs are pretty far down. Poor lil’ guys. Interesting analogy. Hermit crabs move onto new shells because they’ve grown too big for the old shell. If they stay in their current shell, they delay their time of vulnerability, but at the expense of ceasing to grow. Whoa! So fitting. I was ignorant of the biology. Would’ve mentioned that if I’d known. I really like your analogy. We even have a rubric (3-5 grade) for risk taking in mathematics (and life). Right now I am thinking about how you made this brilliant analogy without understanding the biology behind it? That’s a great idea to specify risk-taking as an overt goal of elementary math education. It’s a fundamental (and under-discussed) academic skill. As for the hermit crab analogy… I seem to spew out 7000 metaphors a day, so I guess one of them was bound to make sense eventually!